During my Aldi Test Kitchen 2012 Event trip, I enjoyed a presentation by Janice Stahl on food styling and entertaining on a budget. Here you will discover the top tips I learned during that presentation. Janice Stahl is a food stylist based out of Chicago, Illinois. Over the last eight years she has worked with brands such as Kraft, Sara Lee, Kenmore, and Butterball. Her work has been featured on Oprah and Extreme Makeover Home Edition. Janice is an ALDI shopper. She has said, "Many years ago I figured out that shopping there was not only really inexpensive, but the food was great! I use a lot of their foods on my styling jobs." 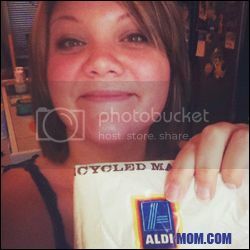 Take it from a pro, ALDI is wonderful and great for families that come from any walk of life! Here are the top tips that I learned from my presentation. Keep it Simple. If you over think your decor, things will end up looking tacky. Keep it simple. Use only white or clear dishes, and white tablecloths. Don't worry about your fancy holiday trays. By keeping everything white you can use other decor items to decorate your tables along with the holiday or theme. Then, you can also save money and time by purchasing only white or clear dishes for entertaining and the same dishes can be re-used time and time again, event to event. To my understanding, a solid colored table cloth would look OK as well, as long as it is a nice solid color. Use other decor items, instead of decorative dishes. For example, you have all your food out in their white and clear dishes, and you have your white tablecloths out. For decorating at Christmas, throw a few ornaments on the table, and mistletoe. For Easter, decorative eggs or pastel flowers. For valentines day, red rose petals. This makes decorating extremely easy and efficient for years to come. Don't put all the alcohol in one room. This will cause crowds to form where the alcohol is. Separate the types of alcohol throughout the area or home. For example, wines with cheese and grapes can be in the corner of the living room, while the beer and peanuts can be in the kitchen. You can also do this with finger foods. This will force your crowd to mingle around the party. Decorate with fruit and vegetables. Purchase clear vases that can be used over and over. (There are small ones at Dollar Tree, and I have found affordable ones at Michael's.) Use the fruit or vegetable of the season and put it inside the vase. You can place it in the vase alone, or with water as shown in the photo above. You might also discover another item that isn't food related that you can put inside the vases. ALDI fruits and vegetables are so cheap, decorating won't hurt your checkbook. What if someone's brings something in an ugly dish or on a tacky tray? Let them know ahead of time you have plenty of dishes for the food, and tell them to bring their food in Tupperware and you will convert it to your matching dish set! Feel free to leave a comment if you have your own budget or time saving tip.